?How long does a broken ankle take to heal? ?Do I need surgery for a Heel Bone Fracture? ?What are symptoms of a stress fracture in the forefoot? 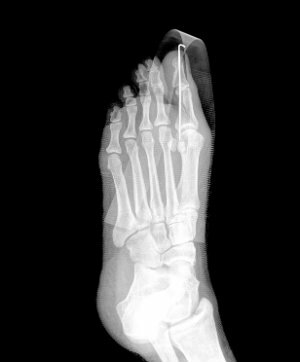 A foot fracture is a common injury seen and treated in our Palm Desert, CA podiatric office. For some patients the injury is a result of a car accident, others come in after a sports injury and some develop a fracture from a trip or fall. A break can occur from dropping something heavy on your foot or from overuse such as long distance running or intense training over time. The severity of a foot fracture varies from patient to patient. It can be a small crack in the bone, called a stress fracture, to a break where the bone pierces through the skin. Are You at Risk for a Foot Fracture? While a foot fracture can happen to anyone at any time. There are situations that heighten the risk and certain patients who are at a higher risk. A cluttered, dimly lit house can create a dangerous atmosphere for feet and ankles. Occupations such as construction, where falling from a height or dropping heavy objects is a risk factor, injuries can happen. Having osteoarthritis or neuropathy in your feet can put you at risk for a fracture. Toe fractures are very common and usually heal well with little to no medical intervention. Taping the injured toe to an adjacent uninjured toe and wearing an orthopedic shoe is an effective treatment method. Surgery is typically only required in severe cases. Car accident victims, runners, football players and those in the military are at a higher risk for a Lisfranc fracture. The Lisfranc joint is where the long bones that go up to your toes meet up with the bones in the arch. A severe twist of the foot or direct force on the foot could cause a break in a bone in the Lisfranc joint. X-rays are often required for an accurate diagnosis as a Lisfranc fracture is often mistaken as an ankle sprain. The long bone on the outside of the foot that connects to the little toe is a common place for fractures to occur. There are many types of fractures that can occur in this area of the foot but usually result from a twisting or rolling of the ankle and trauma to the foot. The calcaneus is the heel bone and typically suffers a fracture after a patient falls from a height or is involved in an automobile accident when the heel is crushed. The heel bone can also suffer stress fractures from overuse and repetitive force on the heel bone. Fractures in the heel bone are fairly serious and could lead to chronic pain and arthritis. Don’t ignore foot pain or problems. Unexplained fractures could be an early sign of osteoporosis and untreated injuries can lead to chronic foot problems. Contact Dr. Danciger as soon as symptoms arise.